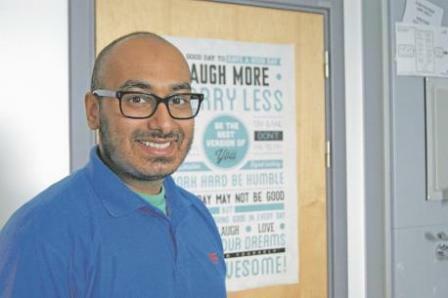 A Southfields man is close to fulfilling the dying wish of his brother to raise £50,000 for blood cancer charity Bloodline.Kamal Aftab died aged 33 on August 7 last year after a six-week battle against Acute Myeloid Leukaemia.Kamal, pictured above after a round of chemotherapy, was a mentor, fundraising champion, and optometrist.After finding out he had leukaemia and only a 50 per cent chance of surviving, Mr Aftab decided to do a full 26-mile marathon from his 5x5sqm hospital room and raise £50,000 for Bloodwise. A charity dinner hosted by Humanity First was recently held at the Baitul Futuh Mosque in Morden to remember Kamal.”At the dinner they named one of their projects after him and Farooq revealed an eye clinic in Burkina Faso, West Africa has also been named after Kamal.Kamal spent more than a decade as a youth mentor in various voluntary capacities.He also organised store collection for a great number of charities and stood shoulder to shoulder with World War II veterans selling poppies. Share the post "Brothers close to raising £50,000 for charity to fulfil dying wish of sibling"